The wood craft of Sorrento is centuries old. 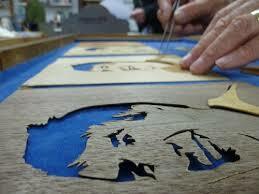 The craftsmen of Sorrento are trained in the art of marquetry and inlay. 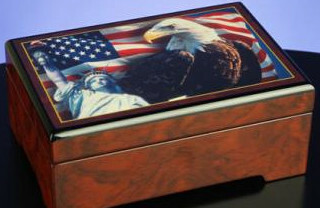 They use special wood veneers to create magnificent pictures with incredible details. The history of the marquetry is dated back to the era of the pharaohs in Egypt. It is an ancient art. 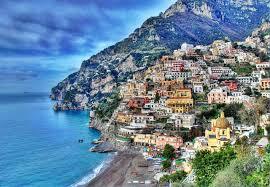 The artisans of Sorrento are the modern experts in the art. They use this technique to create large wall panels, furniture and boxes. Sorrento music boxes that are inlayed with intricate designs are known all over the world and the collectors around the world are after them. In Sorrento they create music boxes of all shapes and sizes. Some are made to hold trinkets and jewels. 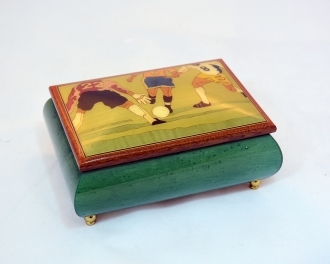 The Sorrento music boxes stand out because of the special kinds of wood they use. They use white poplar, briar, elm rosewood etc. These are woods with different colors and natural burls. The music boxes are made in two steps. First, the wooden box is made and inlays are installed on the lids and in some cases sides also. Thereafter the musical device is placed in it. These two techniques are slightly different from each other. Marquetry is about creating a picture using veneers from different colored w ood pieces. Inlay is the technique in which various colored wood pieces are shaped to form the parts of a picture and then assembled like a jigsaw puzzle. Afterwards the whole thing is planed and polished with special lacquer. There are two main parts to this musical device – a metal drum fitted with tiny pins at strategic places and a metal comb with tuned teeth. They are fixed in position and the drum is rotated so that the pins on it pluck the teeth of the metal comb to produce beautiful music. The drum is fitted with springs which can be wound. Releasing this spring slowly rotates the drum to produce music. The inside of the music box is lined with plush velvet and this musical gadget is placed underneath the lining. The music is played when you open the box. However there are other ingenious ways to activate these boxes. 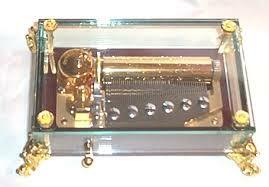 There are music boxes which can be wound up using a key. Another kind of music box is activated by coins. When you put a coin through the slot provided, they produce music. Yet another kind is activated when you clap in front of it. 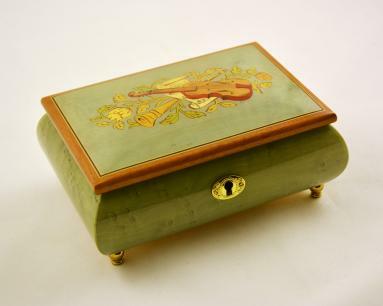 The Sorrento music boxes are handmade individually. That is why each piece is unique. You will not find two music boxes which are exactly the same. they may have the same design but will be different in details. Precious few people in the present generation are interested in carrying on the art. Still Sorrento music boxes occupy an important place among the modern art pieces and collectibles.